Wildfires In Montana, California Scorch Thousands Of Acres, Trigger Evacuations : The Two-Way The fire at Glacier National Park forced the evacuation of a park inn and campground. In California, a fire in Napa was threatening 150 structures. Smoke from the the Reynolds Creek wildfire rises above the landscape at St. Mary Lake in Glacier National Park, Mont. Fast-moving wildfires in Montana and California have scorched thousands of acres and triggered evacuations. "The Reynolds Creek Wildland Fire was first reported about 6 p.m. ET on the east side of Glacier National Park, according to a news release by the National Parks Service. "Within hours the inferno prompted evacuations of a park inn and campground. Officials also closed a portion of the Going-to-the-Sun Road, a nearly 50-mile roadway that runs through the park." The AP reports that the weather forecast calls for low humidity and wind gusts, increasing the risk of fire. 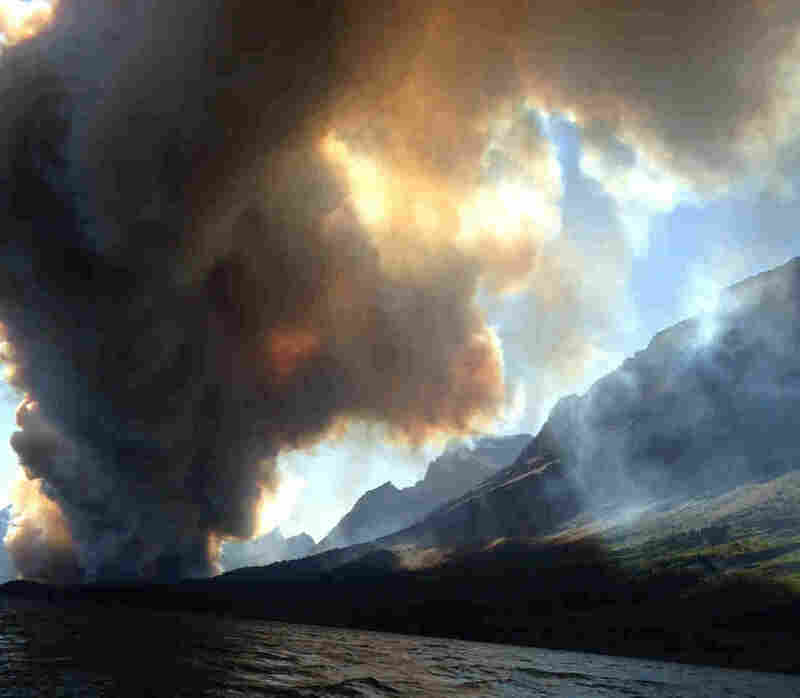 "These conditions may create explosive fire growth potential," Glacier National Park spokeswoman Denise Germann told the AP. "The blaze first broke out about 2:30 p.m. near Highway 128 and Greaves Road, according to the California Department of Forestry and Fire Protection. Flames spread swiftly through the steep, rugged terrain near the borders of Napa, Solano and Yolo counties, Cal Fire officials said. "Erratic winds posed a challenge to the 400 firefighters deployed to battle the blaze, which has prompted the closure of Highway 128, according to the state fire agency. "Evacuations were ordered for the Cold Canyon, Mix Canyon and Quail Ridge. Three hikers in Cold Canyon were rescued, said Cal Fire spokesman Daniel Berlant. Campers in the Canyon Creek and Lake Solano campgrounds were also evacuated, officials said."